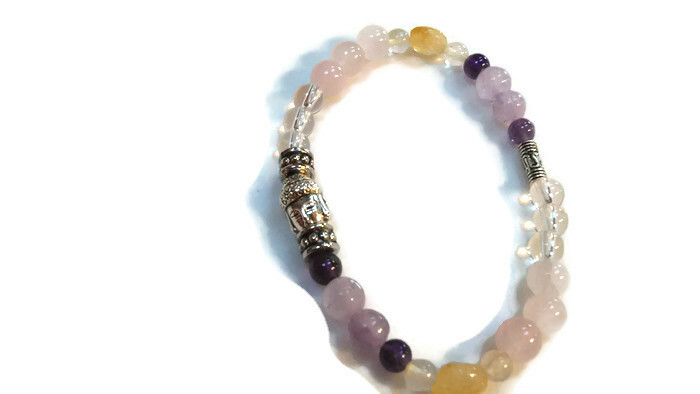 Healing crystals and gemstones can be used to treat Fibromyalgia with traditional medicine as part of a holistic approach to wellness. This information is not intended to replace regular medical care with your doctor but instead should be used as one of many choices to good health. Many believe that Fibromyalgia is caused by an abnormal sensory processing in the central nervous system. Chronic pain, joint tenderness, muscle soreness, fatigue, depression, stress and anxiety are some of the many symptoms one experiences. The stones in this bracelet can help address some of these symptoms to help you feel relief. 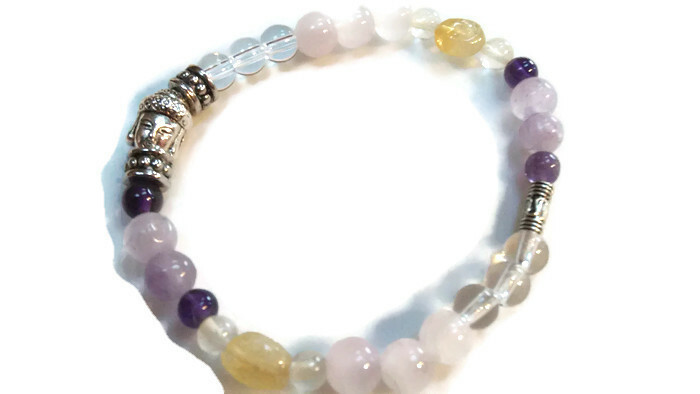 The stones used in this version are Amethyst, Citrine, Rose Quartz, and Clear Quartz. Amethyst has a soothing and relaxing effect on people. It can help promote healthy sleep habits when worn or placed under your pillow. It also helps alleviate migraines, improves circulation, calms mental disorders, strengthens the immune system and helps to balance and heal the chakras. It also helps with arthritis and pain relief. Citrine promotes stomach functioning and aids in intestinal reg ularity. It helps alleviate depression, self doubt and diminish mood swings. It is associated with the solar plexus chakra. Clear Quartz is called the master healer and is considered a very cleansing stone. It harmonizes and balances. It is associated with the crown chakra. Rose Quartz is associated with the heart chakra. It is beneficial in all forms of healing and provides relief as well as protection. 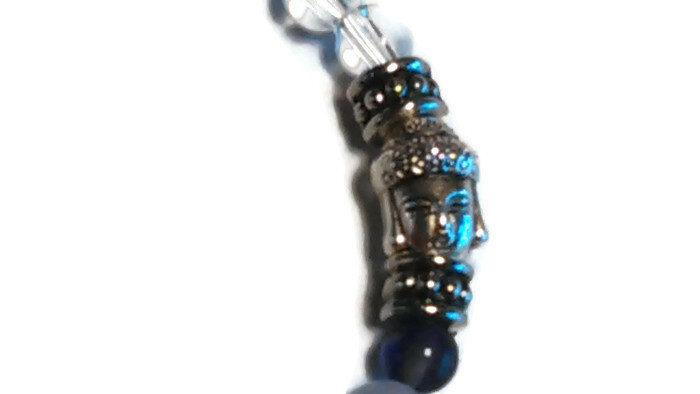 This entry was posted in arthritis, arthritis, Buddha, chakras, Chronic Pain, conditions and diseases, crystal healing, crystals, death, depression, dying, dying, Fibro, fibro, fibro, Fibro Warriors, Fibromyalgia, fibromyalgia, gemstone healing, gemstones, grief, grief, hair loss, Herbal Medicine, herbal remedies, herbal remedies, Hypothyroidism, life, life, Medicine, Musculoskeletal Disorders, musculoskeletal Disorders, Natural Foods, natural foods, pain, pain, Self Help, selh help, Shopping, shopping, spiritual, Spoon Theory, Spoonies, Survivors, Symptom, symptom, thyroid, Uncategorized, wrong diagnosis, wrong diagnosis, yalgia and tagged amethyst, arthritis, Buddha, caretaker, chakras, chronic illness, citrine, clear quartz, Conditions and Diseases, crystals, family, Fibro Fog, Fibromyalgia, forgetfullness, friends, gemstones, gifts, growing old, healing, Health, Heating pad, Herbal Medicine Natural Foods, herbal remedies, hypothyroid, invisible illness, laughter, life, mid life, missed diagnosis, moving'aging, Musculoskeletal Disorders, muskoskeletal disorders, natural remedies, nature, Pain, pain relief, personal pain, psoriasis, psoriatic arthritis, remedies, rose quartz, Shopping, Symptom, therapy, where to go. Bookmark the permalink.